As Chief Investment Officer, Mark Keller provides overall leadership and oversees all of Confluence’s investment strategies and investment operations, including equity strategies, asset allocation and alternative investments. As an analyst, he focuses on Conglomerates and Special Situations. In addition to his active involvement in the investment decisions of the firm, Mark has been instrumental in product development. Mark has over 40 years of investment experience, with a focus on value-oriented equity analysis and management. Prior to joining Confluence, Mark was a senior vice president of A.G. Edwards & Sons, Inc. and of Gallatin Asset Management, Inc., and was a member of the Board of Directors of both companies. From 1994 to May 2008, he was Chief Investment Officer of Gallatin Asset Management, Inc., and its predecessor organization, A.G. Edwards Asset Management, the investment management arm of A.G. Edwards, Inc. Mark and his team were responsible for the management of over $10 billion of assets across various equity, asset allocation and fixed income strategies. From 1999 to 2008, Mark was Chairman of the A.G. Edwards Investment Strategy Committee, which set investment policy and established asset allocation models for the entire organization. He was a founding member of this body and served on it for over 20 years. 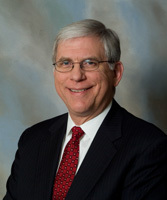 Mark began his career with A.G. Edwards in 1978, serving as an equity analyst for the firm’s Securities Research Department from 1979 to 1994. During his last five years in Securities Research, Mark was equity strategist and manager of the firm’s Focus List. Mark earned his Bachelor of Arts from Wheaton College (Illinois) and is a CFA charter holder.